The pattern map above highlights some relationships between patterns (blue) and anti-patterns (orange) that are documented in this guide. There are of many other patterns that are worth considering. For example, one of the key scenarios for Table Service is to use the Materialized View Pattern from the Command Query Responsibility Segregation (CQRS) pattern. Store multiple copies of each entity using different RowKey values (in the same partition) to enable fast and efficient lookups and alternate sort orders by using different RowKey values. Updates between copies can be kept consistent using EGT's. The Table service automatically indexes entities using the PartitionKey and RowKey values. This enables a client application to retrieve an entity efficiently using these values. 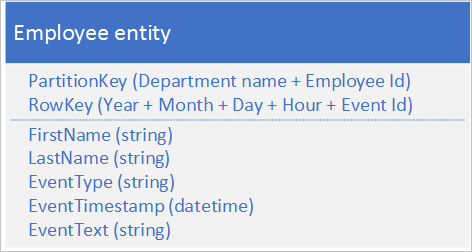 For example, using the table structure shown below, a client application can use a point query to retrieve an individual employee entity by using the department name and the employee ID (the PartitionKey and RowKey values). 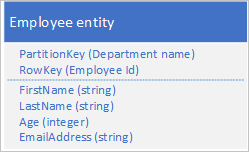 A client can also retrieve entities sorted by employee ID within each department. If you also want to be able to find an employee entity based on the value of another property, such as email address, you must use a less efficient partition scan to find a match. This is because the table service does not provide secondary indexes. In addition, there is no option to request a list of employees sorted in a different order than RowKey order. To work around the lack of secondary indexes, you can store multiple copies of each entity with each copy using a different RowKey value. 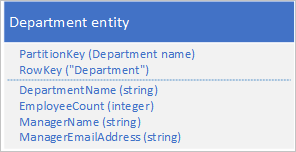 If you store an entity with the structures shown below, you can efficiently retrieve employee entities based on email address or employee ID. The prefix values for the RowKey, "empid_" and "email_" enable you to query for a single employee or a range of employees by using a range of email addresses or employee ids. 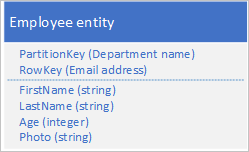 If you query for a range of employee entities, you can specify a range sorted in employee ID order, or a range sorted in email address order by querying for entities with the appropriate prefix in the RowKey. Note that the filter syntax used in the examples above is from the Table service REST API, for more information see Query Entities. Table storage is relatively cheap to use so the cost overhead of storing duplicate data should not be a major concern. However, you should always evaluate the cost of your design based on your anticipated storage requirements and only add duplicate entities to support the queries your client application will execute. Because the secondary index entities are stored in the same partition as the original entities, you should ensure that you do not exceed the scalability targets for an individual partition. You can keep your duplicate entities consistent with each other by using EGTs to update the two copies of the entity atomically. This implies that you should store all copies of an entity in the same partition. For more information, see the section Using Entity Group Transactions. The value used for the RowKey must be unique for each entity. Consider using compound key values. Padding numeric values in the RowKey (for example, the employee ID 000223), enables correct sorting and filtering based on upper and lower bounds. It is typically better to store duplicate data and ensure that you can retrieve all the data you need with a single query, than to use one query to locate an entity and another to lookup the required data. Use this pattern when your client application needs to retrieve entities using a variety of different keys, when your client needs to retrieve entities in different sort orders, and where you can identify each entity using a variety of unique values. However, you should be sure that you do not exceed the partition scalability limits when you are performing entity lookups using the different RowKey values. Store multiple copies of each entity using different RowKey values in separate partitions or in separate tables to enable fast and efficient lookups and alternate sort orders by using different RowKey values. You are anticipating a very high volume of transactions against these entities and want to minimize the risk of the Table service throttling your client. To work around the lack of secondary indexes, you can store multiple copies of each entity with each copy using different PartitionKey and RowKey values. If you store an entity with the structures shown below, you can efficiently retrieve employee entities based on email address or employee ID. The prefix values for the PartitionKey, "empid_" and "email_" enable you to identify which index you want to use for a query. You can keep your duplicate entities eventually consistent with each other by using the Eventually consistent transactions pattern to maintain the primary and secondary index entities. It is typically better to store duplicate data and ensure that you can retrieve all the data you need with a single query than to use one query to locate an entity using the secondary index and another to lookup the required data in the primary index. Use this pattern when your client application needs to retrieve entities using a variety of different keys, when your client needs to retrieve entities in different sort orders, and where you can identify each entity using a variety of unique values. Use this pattern when you want to avoid exceeding the partition scalability limits when you are performing entity lookups using the different RowKey values. Enable eventually consistent behavior across partition boundaries or storage system boundaries by using Azure queues. Entities stored in two different partitions in the same table, in different tables, or in different storage accounts. An entity stored in the Table service and a blob stored in the Blob service. An entity stored in the Table service and a file in a file system. An entity store in the Table service yet indexed using the Azure Search service. By using Azure queues, you can implement a solution that delivers eventual consistency across two or more partitions or storage systems. To illustrate this approach, assume you have a requirement to be able to archive old employee entities. Old employee entities are rarely queried and should be excluded from any activities that deal with current employees. To implement this requirement you store active employees in the Current table and old employees in the Archive table. Archiving an employee requires you to delete the entity from the Current table and add the entity to the Archive table, but you cannot use an EGT to perform these two operations. To avoid the risk that a failure causes an entity to appear in both or neither tables, the archive operation must be eventually consistent. The following sequence diagram outlines the steps in this operation. More detail is provided for exception paths in the text following. A client initiates the archive operation by placing a message on an Azure queue, in this example to archive employee #456. A worker role polls the queue for new messages; when it finds one, it reads the message and leaves a hidden copy on the queue. The worker role next fetches a copy of the entity from the Current table, inserts a copy in the Archive table, and then deletes the original from the Current table. Finally, if there were no errors from the previous steps, the worker role deletes the hidden message from the queue. In this example, step 4 inserts the employee into the Archive table. It could add the employee to a blob in the Blob service or a file in a file system. It is important that the operations in steps 4 and 5 must be idempotent in case the worker role needs to restart the archive operation. If you are using the Table service, for step 4 you should use an "insert or replace" operation; for step 5 you should use a "delete if exists" operation in the client library you are using. If you are using another storage system, you must use an appropriate idempotent operation. If the worker role never completes step 6, then after a timeout the message reappears on the queue ready for the worker role to try to reprocess it. The worker role can check how many times a message on the queue has been read and, if necessary, flag it is a "poison" message for investigation by sending it to a separate queue. For more information about reading queue messages and checking the dequeue count, see Get Messages. Some errors from the Table and Queue services are transient errors, and your client application should include suitable retry logic to handle them. This solution does not provide for transaction isolation. For example, a client could read the Current and Archive tables when the worker role was between steps 4 and 5, and see an inconsistent view of the data. Note that the data will be consistent eventually. You must be sure that steps 4 and 5 are idempotent in order to ensure eventual consistency. You can scale the solution by using multiple queues and worker role instances. Use this pattern when you want to guarantee eventual consistency between entities that exist in different partitions or tables. You can extend this pattern to ensure eventual consistency for operations across the Table service and the Blob service and other non-Azure Storage data sources such as database or the file system. If transaction isolation is important to your solution, you should consider redesigning your tables to enable you to use EGTs. Maintain index entities to enable efficient searches that return lists of entities. The Table service automatically indexes entities using the PartitionKey and RowKey values. This enables a client application to retrieve an entity efficiently using a point query. 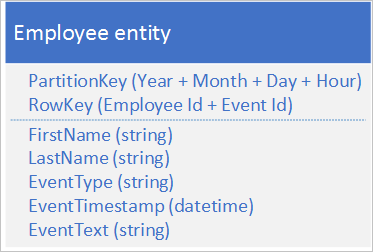 For example, using the table structure shown below, a client application can efficiently retrieve an individual employee entity by using the department name and the employee ID (the PartitionKey and RowKey). If you also want to be able to retrieve a list of employee entities based on the value of another non-unique property, such as their last name, you must use a less efficient partition scan to find matches rather than using an index to look them up directly. This is because the table service does not provide secondary indexes. Create index entities in the same partition as the employee entities. Create index entities in a separate partition or table. For the first option, you create a blob for every unique last name, and in each blob store a list of the PartitionKey (department) and RowKey (employee ID) values for employees that have that last name. When you add or delete an employee you should ensure that the content of the relevant blob is eventually consistent with the employee entities. The EmployeeIDs property contains a list of employee ids for employees with the last name stored in the RowKey. Retrieve the index entity with a PartitionKey value "Sales" and the RowKey value "Jones." Save the ETag of this entity to use in step 2. Create an entity group transaction (that is, a batch operation) that inserts the new employee entity (PartitionKey value "Sales" and RowKey value "000152"), and updates the index entity (PartitionKey value "Sales" and RowKey value "Jones") by adding the new employee ID to the list in the EmployeeIDs field. For more information about entity group transactions, see Entity Group Transactions. If the entity group transaction fails because of an optimistic concurrency error (someone else has just modified the index entity), then you need to start over at step 1 again. You can use a similar approach to deleting an employee if you are using the second option. Changing an employee's last name is slightly more complex because you will need to execute an entity group transaction that updates three entities: the employee entity, the index entity for the old last name, and the index entity for the new last name. You must retrieve each entity before making any changes in order to retrieve the ETag values that you can then use to perform the updates using optimistic concurrency. Retrieve the index entity with a PartitionKey value "Sales" and the RowKey value "Jones." Parse the list of employee Ids in the EmployeeIDs field. If you need additional information about each of these employees (such as their email addresses), retrieve each of the employee entities using PartitionKey value "Sales" and RowKey values from the list of employees you obtained in step 2. With the third option, you cannot use EGTs to maintain consistency because the index entities are in a separate partition from the employee entities. You should ensure that the index entities are eventually consistent with the employee entities. This solution requires at least two queries to retrieve matching entities: one to query the index entities to obtain the list of RowKey values, and then queries to retrieve each entity in the list. Given that an individual entity has a maximum size of 1 MB, option #2 and option #3 in the solution assume that the list of employee ids for any given last name is never greater than 1 MB. If the list of employee ids is likely to be greater than 1 MB in size, use option #1 and store the index data in blob storage. If you use option #2 (using EGTs to handle adding and deleting employees, and changing an employee's last name) you must evaluate if the volume of transactions will approach the scalability limits in a given partition. If this is the case, you should consider an eventually consistent solution (option #1 or option #3) that uses queues to handle the update requests and enables you to store your index entities in a separate partition from the employee entities. Option #2 in this solution assumes that you want to look up by last name within a department: for example, you want to retrieve a list of employees with a last name Jones in the Sales department. If you want to be able to look up all the employees with a last name Jones across the whole organization, use either option #1 or option #3. You can implement a queue-based solution that delivers eventual consistency (see the Eventually consistent transactions pattern for more details). Use this pattern when you want to lookup a set of entities that all share a common property value, such as all employees with the last name Jones. Combine related data together in a single entity to enable you to retrieve all the data you need with a single point query. In a relational database, you typically normalize data to remove duplication resulting in queries that retrieve data from multiple tables. If you normalize your data in Azure tables, you must make multiple round trips from the client to the server to retrieve your related data. For example, with the table structure shown below you need two round trips to retrieve the details for a department: one to fetch the department entity that includes the manager's ID, and then another request to fetch the manager's details in an employee entity. With department entities stored with these properties, you can now retrieve all the details you need about a department using a point query. There is some cost overhead associated with storing some data twice. The performance benefit (resulting from fewer requests to the storage service) typically outweighs the marginal increase in storage costs (and this cost is partially offset by a reduction in the number of transactions you require to fetch the details of a department). You must maintain the consistency of the two entities that store information about managers. You can handle the consistency issue by using EGTs to update multiple entities in a single atomic transaction: in this case, the department entity, and the employee entity for the department manager are stored in the same partition. Use this pattern when you frequently need to look up related information. This pattern reduces the number of queries your client must make to retrieve the data it requires. Use compound RowKey values to enable a client to lookup related data with a single point query. In a relational database, it is quite natural to use joins in queries to return related pieces of data to the client in a single query. For example, you might use the employee ID to look up a list of related entities that contain performance and review data for that employee. Notice that with this approach you may decide to duplicate some information (such as first name and last name) in the new entity to enable you to retrieve your data with a single request. However, you cannot maintain strong consistency because you cannot use an EGT to update the two entities atomically. 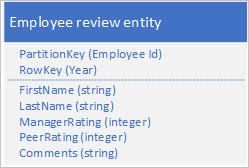 Notice how the RowKey is now a compound key made up of the employee ID and the year of the review data that enables you to retrieve the employee's performance and review data with a single request for a single entity. You should use a suitable separator character that makes it easy to parse the RowKey value: for example, 000123_2012. You are also storing this entity in the same partition as other entities that contain related data for the same employee, which means you can use EGTs to maintain strong consistency. You should consider how frequently you will query the data to determine whether this pattern is appropriate. For example, if you will access the review data infrequently and the main employee data often you should keep them as separate entities. Use this pattern when you need to store one or more related entities that you query frequently. Retrieve the n entities most recently added to a partition by using a RowKey value that sorts in reverse date and time order. A common requirement is be able to retrieve the most recently created entities, for example the ten most recent expense claims submitted by an employee. Table queries support a $top query operation to return the first n entities from a set: there is no equivalent query operation to return the last n entities in a set. Store the entities using a RowKey that naturally sorts in reverse date/time order by using so the most recent entry is always the first one in the table. You must pad the reverse tick value with leading zeroes to ensure the string value sorts as expected. You must be aware of the scalability targets at the level of a partition. Be careful not create hot spot partitions. Use this pattern when you need to access entities in reverse date/time order or when you need to access the most recently added entities. Enable the deletion of a high volume of entities by storing all the entities for simultaneous deletion in their own separate table; you delete the entities by deleting the table. Many applications delete old data which no longer needs to be available to a client application, or that the application has archived to another storage medium. You typically identify such data by a date: for example, you have a requirement to delete records of all login requests that are more than 60 days old. This approach avoids partition hotspots because the application can insert and delete login entities for each user in a separate partition. However, this approach may be costly and time consuming if you have a large number of entities because first you need to perform a table scan in order to identify all the entities to delete, and then you must delete each old entity. Note that you can reduce the number of round trips to the server required to delete the old entities by batching multiple delete requests into EGTs. Use a separate table for each day of login attempts. You can use the entity design above to avoid hotspots when you are inserting entities, and deleting old entities is now simply a question of deleting one table every day (a single storage operation) instead of finding and deleting hundreds and thousands of individual login entities every day. Does your design support other ways your application will use the data such as looking up specific entities, linking with other data, or generating aggregate information? Does your design avoid hot spots when you are inserting new entities? Expect a delay if you want to reuse the same table name after deleting it. It's better to always use unique table names. Expect some throttling when you first use a new table while the Table service learns the access patterns and distributes the partitions across nodes. You should consider how frequently you need to create new tables. Use this pattern when you have a high volume of entities that you must delete at the same time. Store complete data series in a single entity to minimize the number of requests you make. With this design, you can easily locate and update the entity to update for each employee whenever the application needs to update the message count value. However, to retrieve the information to plot a chart of the activity for the preceding 24 hours, you must retrieve 24 entities. 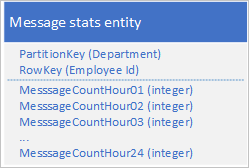 With this design, you can use a merge operation to update the message count for an employee for a specific hour. Now, you can retrieve all the information you need to plot the chart using a request for a single entity. If your complete data series does not fit into a single entity (an entity can have up to 252 properties), use an alternative data store such as a blob. If you have multiple clients updating an entity simultaneously, you will need to use the ETag to implement optimistic concurrency. If you have many clients, you may experience high contention. Use this pattern when you need to update and retrieve a data series associated with an individual entity. Use multiple physical entities to store logical entities with more than 252 properties. An individual entity can have no more than 252 properties (excluding the mandatory system properties) and cannot store more than 1 MB of data in total. In a relational database, you would typically get round any limits on the size of a row by adding a new table and enforcing a 1-to-1 relationship between them. If you need to make a change that requires updating both entities to keep them synchronized with each other you can use an EGT. Otherwise, you can use a single merge operation to update the message count for a specific day. 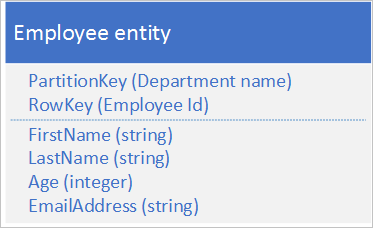 To retrieve all the data for an individual employee you must retrieve both entities, which you can do with two efficient requests that use both a PartitionKey and a RowKey value. Retrieving a complete logical entity involves at least two storage transactions: one to retrieve each physical entity. Use this pattern when need to store entities whose size or number of properties exceeds the limits for an individual entity in the Table service. Use blob storage to store large property values. An individual entity cannot store more than 1 MB of data in total. If one or several of your properties store values that cause the total size of your entity to exceed this value, you cannot store the entire entity in the Table service. 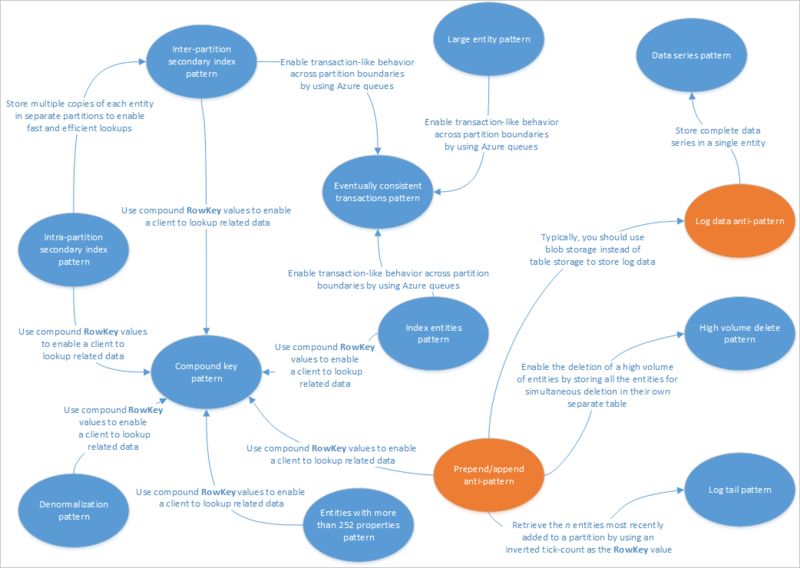 To maintain eventual consistency between the entity in the Table service and the data in the Blob service, use the Eventually consistent transactions pattern to maintain your entities. Retrieving a complete entity involves at least two storage transactions: one to retrieve the entity and one to retrieve the blob data. Use this pattern when you need to store entities whose size exceeds the limits for an individual entity in the Table service. Increase scalability when you have a high volume of inserts by spreading the inserts across multiple partitions. Notice with this example how both the PartitionKey and RowKey are compound keys. The PartitionKey uses both the department and employee ID to distribute the logging across multiple partitions. Does the alternative key structure that avoids creating hot partitions on inserts efficiently support the queries your client application makes? Does your anticipated volume of transactions mean that you are likely to reach the scalability targets for an individual partition and be throttled by the storage service? Avoid the prepend/append anti-pattern when your volume of transactions is likely to result in throttling by the storage service when you access a hot partition. Typically, you should use the Blob service instead of the Table service to store log data. In this example, the RowKey includes the date and time of the log message to ensure that log messages are stored sorted in date/time order, and includes a message ID in case multiple log messages share the same date and time. However, the problem with this schema is that to retrieve all the log messages for a specific time span you must search every partition in the table. The previous section highlighted the problem of trying to use the Table service to store log entries and suggested two, unsatisfactory, designs. One solution led to a hot partition with the risk of poor performance writing log messages; the other solution resulted in poor query performance because of the requirement to scan every partition in the table to retrieve log messages for a specific time span. Blob storage offers a better solution for this type of scenario and this is how Azure Storage Analytics stores the log data it collects. This section outlines how Storage Analytics stores log data in blob storage as an illustration of this approach to storing data that you typically query by range. Storage Analytics stores log messages in a delimited format in multiple blobs. The delimited format makes it easy for a client application to parse the data in the log message. Storage Analytics uses a naming convention for blobs that enables you to locate the blob (or blobs) that contain the log messages for which you are searching. For example, a blob named "queue/2014/07/31/1800/000001.log" contains log messages that relate to the queue service for the hour starting at 18:00 on 31 July 2014. The "000001" indicates that this is the first log file for this period. Storage Analytics also records the timestamps of the first and last log messages stored in the file as part of the blob's metadata. The API for blob storage enables you locate blobs in a container based on a name prefix: to locate all the blobs that contain queue log data for the hour starting at 18:00, you can use the prefix "queue/2014/07/31/1800." Storage Analytics buffers log messages internally and then periodically updates the appropriate blob or creates a new one with the latest batch of log entries. This reduces the number of writes it must perform to the blob service. If you are implementing a similar solution in your own application, you must consider how to manage the trade-off between reliability (writing every log entry to blob storage as it happens) and cost and scalability (buffering updates in your application and writing them to blob storage in batches). If you create a table design that avoids potential hot partitions, you may find that you cannot access your log data efficiently. To process log data, a client often needs to load many records. Although log data is often structured, blob storage may be a better solution. This section discusses some of the considerations to bear in mind when you implement the patterns described in the previous sections. Most of this section uses examples written in C# that use the Storage Client Library (version 4.3.0 at the time of writing). As discussed in the section Design for querying, the most efficient query is a point query. However, in some scenarios you may need to retrieve multiple entities. This section describes some common approaches to retrieving entities using the Storage Client Library. Notice how this example expects the entity it retrieves to be of type EmployeeEntity. Notice how the query specifies both a RowKey and a PartitionKey to ensure better performance. The sample nests multiple CombineFilters methods to include the three filter conditions. An optimal query returns an individual entity based on a PartitionKey value and a RowKey value. However, in some scenarios you may have a requirement to return many entities from the same partition or even from many partitions. You should always fully test the performance of your application in such scenarios. A query against the table service may return a maximum of 1,000 entities at one time and may execute for a maximum of five seconds. If the result set contains more than 1,000 entities, if the query did not complete within five seconds, or if the query crosses the partition boundary, the Table service returns a continuation token to enable the client application to request the next set of entities. For more information about how continuation tokens work, see Query Timeout and Pagination. It enables you to limit the amount of data to retrieve from the Table service and that you move over the network. It enables you to perform asynchronous IO in .NET. It enables you to serialize the continuation token to persistent storage so you can continue in the event of an application crash. A continuation token typically returns a segment containing 1,000 entities, although it may be fewer. This is also the case if you limit the number of entries a query returns by using Take to return the first n entities that match your lookup criteria: the table service may return a segment containing fewer than n entities along with a continuation token to enable you to retrieve the remaining entities. A single entity can have up to 255 properties and be up to 1 MB in size. When you query the table and retrieve entities, you may not need all the properties and can avoid transferring data unnecessarily (to help reduce latency and cost). You can use server-side projection to transfer just the properties you need. The following example is retrieves just the Email property (along with PartitionKey, RowKey, Timestamp, and ETag) from the entities selected by the query. Notice how the RowKey value is available even though it was not included in the list of properties to retrieve. The Storage Client Library enables you to modify your entities stored in the table service by inserting, deleting, and updating entities. You can use EGTs to batch multiple insert, update, and delete operations together to reduce the number of round trips required and improve the performance of your solution. Note that exceptions thrown when the Storage Client Library executes an EGT typically include the index of the entity that caused the batch to fail. This is helpful when you are debugging code that uses EGTs. You should also consider how your design affects how your client application handles concurrency and update operations. By default, the table service implements optimistic concurrency checks at the level of individual entities for Insert, Merge, and Delete operations, although it is possible for a client to force the table service to bypass these checks. For more information about how the table service manages concurrency, see Managing Concurrency in Microsoft Azure Storage. The Replace method of the TableOperation class always replaces the complete entity in the Table service. If you do not include a property in the request when that property exists in the stored entity, the request removes that property from the stored entity. Unless you want to remove a property explicitly from a stored entity, you must include every property in the request. You can use the Merge method of the TableOperation class to reduce the amount of data that you send to the Table service when you want to update an entity. The Merge method replaces any properties in the stored entity with property values from the entity included in the request, but leaves intact any properties in the stored entity that are not included in the request. This is useful if you have large entities and only need to update a small number of properties in a request. The Replace and Merge methods fail if the entity does not exist. As an alternative, you can use the InsertOrReplace and InsertOrMerge methods that create a new entity if it doesn't exist. Prepend the entity type to the RowKey (or possibly the PartitionKey). For example, EMPLOYEE_000123 or DEPARTMENT_SALES as RowKey values. Use a separate property to record the entity type as shown in the table below. The first option, prepending the entity type to the RowKey, is useful if there is a possibility that two entities of different types might have the same key value. It also groups entities of the same type together in the partition. The techniques discussed in this section are especially relevant to the discussion Inheritance relationships earlier in this guide in the article Modeling relationships. You should consider including a version number in the entity type value to enable client applications to evolve POCO objects and work with different versions. The remainder of this section describes some of the features in the Storage Client Library that facilitate working with multiple entity types in the same table. If you are using the Storage Client Library, you have three options for working with multiple entity types. 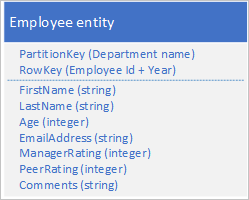 If you know the type of the entity stored with a specific RowKey and PartitionKey values, then you can specify the entity type when you retrieve the entity as shown in the previous two examples that retrieve entities of type EmployeeEntity: Executing a point query using the Storage Client Library and Retrieving multiple entities using LINQ. Note that to retrieve other properties you must use the TryGetValue method on the Properties property of the DynamicTableEntity class. A third option is to combine using the DynamicTableEntity type and an EntityResolver instance. This enables you to resolve to multiple POCO types in the same query. In this example, the EntityResolver delegate is using the EntityType property to distinguish between the two types of entity that the query returns. The Resolve method uses the resolver delegate to resolve DynamicTableEntity instances to TableEntity instances. You do not need to know the type of an entity to delete it, and you always know the type of an entity when you insert it. However, you can use DynamicTableEntity type to update an entity without knowing its type and without using a POCO entity class. The following code sample retrieves a single entity, and checks the EmployeeCount property exists before updating it. You do not need to distribute your storage account key to an insecure platform (such as a mobile device) in order to allow that device to access and modify entities in the Table service. You can offload some of the work that web and worker roles perform in managing your entities to client devices such as end-user computers and mobile devices. You can assign a constrained and time limited set of permissions to a client (such as allowing read-only access to specific resources). For more information about using SAS tokens with the Table service, see Using Shared Access Signatures (SAS). However, you must still generate the SAS tokens that grant a client application to the entities in the table service: you should do this in an environment that has secure access to your storage account keys. Typically, you use a web or worker role to generate the SAS tokens and deliver them to the client applications that need access to your entities. Because there is still an overhead involved in generating and delivering SAS tokens to clients, you should consider how best to reduce this overhead, especially in high-volume scenarios. It is possible to generate a SAS token that grants access to a subset of the entities in a table. By default, you create a SAS token for an entire table, but it is also possible to specify that the SAS token grant access to either a range of PartitionKey values, or a range of PartitionKey and RowKey values. You might choose to generate SAS tokens for individual users of your system such that each user's SAS token only allows them access to their own entities in the table service. Provided you are spreading your requests across multiple partitions, you can improve throughput and client responsiveness by using asynchronous or parallel queries. For example, you might have two or more worker role instances accessing your tables in parallel. You could have individual worker roles responsible for particular sets of partitions, or simply have multiple worker role instances, each able to access all the partitions in a table. The method signature now includes the async modifier and returns a Task instance. Instead of calling the ExecuteSegmented method to retrieve results, the method now calls the ExecuteSegmentedAsync method and uses the await modifier to retrieve results asynchronously. The client application can call this method multiple times (with different values for the department parameter), and each query will run on a separate thread. Note that there is no asynchronous version of the Execute method in the TableQuery class because the IEnumerable interface does not support asynchronous enumeration. Instead of calling the Execute method to update the entity, the method now calls the ExecuteAsync method and uses the await modifier to retrieve results asynchronously. The client application can call multiple asynchronous methods like this one, and each method invocation will run on a separate thread.